Terrorism is a term used to describe violence or other harmful acts committed (or threatened) against civilians by groups or persons for political or other ideological goals. Most definitions of terrorism include only those acts which are intended to create fear or "terror," are perpetrated for a political goal (as opposed to a hate crime or "madman" attack), and deliberately target "non-combatants." Some definitions include a priori immunity for the "legitimate" government. Consistent definitions may not restrict or fix in advance the list of possible affected subjects and must include state terrorism. In many cases the determination of "legitimate" targets and the definition of "combatant" are disputed, especially by partisans to the conflict in question. Many people find the terms "terrorism" and "terrorist" (someone who engages in terrorism) to have a negative connotation. These terms are often used as political labels to condemn violence or threat of violence by certain actors as immoral, indiscriminate, or unjustified. Those labeled "terrorists" may not identify themselves as such, and typically use other generic terms or terms specific to their situation, such as separatist, freedom fighter, liberator, revolutionary, guerrilla, or jihadi. While the name of the acts and actors may be disputed, the violence is nonetheless all too real and "terrible." Responses to the use of such methods to achieve any goal, worthy or not, have often involved additional violence, and ignored the reasons that led to the perpetration of the acts. Without addressing the underlying problems, solutions are unlikely. The term terrorism comes from the French word terrorisme, which is based on the Latin verb terrere (to cause to tremble). intended to cause death or serious bodily harm to civilians or non-combatants with the purpose of intimidating a population or compelling a government or an international organization to do or abstain from doing any act. Few words are as politically or emotionally charged as terrorism. A 1988 study by the U.S. Army counted 109 definitions of terrorism that covered a total of 22 different definitional elements. Terrorism expert Walter Laqueur also counted over 100 definitions and concluded that the "only general characteristic generally agreed upon is that terrorism involves violence and the threat of violence." For this and for political reasons, many news sources avoid using this term, opting instead for less accusatory words like "bombers," "militants," and so forth. Terrorism is a crime in many countries and is defined by statute. Common principles amongst legal definitions of terrorism provide an emerging consensus as to meaning and also foster cooperation between law enforcement personnel in different countries. Among these definitions, several do not recognize the possibility of the legitimate use of violence by civilians against an invader in an occupied country, and would thus label all resistance movements as terrorist groups. Others make a distinction between lawful and unlawful use of violence. Russia for example includes in their terrorist list only those organizations which represent the greatest threat to their own security. Ultimately, the distinction is a political judgment. As terrorism ultimately involves the use or threat of violence with the aim of creating fear not only to the victims but among a wide audience, it is fear which distinguishes terrorism from both conventional and guerrilla warfare. While both conventional military forces may engage in psychological warfare and guerrilla forces may engage in acts of terror and other forms of propaganda, they both aim at military victory. Terrorism on the other hand aims to achieve political or other goals, when direct military victory is not possible. This has resulted in some social scientists referring to guerrilla warfare as the "weapon of the weak" and terrorism as the "weapon of the weakest." The definition of terrorism is inherently controversial. The use of violence for the achievement of political ends is common to state and non-state groups. The difficulty is in agreeing on a basis for determining when the use of violence (directed at whom, by whom, for what ends) is legitimate. The majority of definitions in use have been written by agencies directly associated with a government, and are systematically biased to exclude governments from the definition. Some such definitions are so broad, like the Terrorism Act 2000, as to include the disruption of a computer system wherein no violence is intended or results. The contemporary label of "terrorist" is highly pejorative; it is a badge which denotes a lack of legitimacy and morality. The appellation "terrorist" is therefore disputed. Attempts at defining the concept invariably arouse debate because rival definitions may be employed with a view to including the actions of certain parties, and excluding others. Thus, each party might still subjectively claim a legitimate basis for employing violence in pursuit of their own political cause or aim. This controversy can be summed up by the aphorism, "One man's terrorist is another man's freedom fighter." This is exemplified when a group that uses irregular military methods is an ally of a state against a mutual enemy, but later falls out with the state and starts to use the same methods against its former ally. During World War II, the Malayan People’s Anti-Japanese Army was allied with the British, but during the Malayan Emergency, members of its successor, the Malayan Races Liberation Army, were branded terrorists by the British. President Ronald Reagan and others in the American administration frequently called the Afghan Mujahideen "freedom fighters" during their war against the Soviet Union, yet twenty years later when a new generation of Afghan men were fighting against what they perceive to be a regime installed by foreign powers, their attacks were labeled terrorism by President Bush. Some groups, when involved in a "liberation" struggle, are called terrorist by governments or media. Later, these same persons, as leaders of the liberated nations, are called statesmen by similar organizations. Notable examples include Nobel Peace Prize laureates Menachem Begin, Yasser Arafat, and Nelson Mandela. There is the famous statement: "One man's terrorist is another man's freedom fighter." But that is grossly leading. It assesses the validity of the cause when terrorism is an act. One can have a perfectly beautiful cause and yet if one commits terrorist acts, it is terrorism regardless. Most official definitions of terrorism focus on the nature of the act, not the validity of the cause. They outline the following key criteria: target, objective, motive, perpetrator, and legitimacy or legality of the act. Terrorism is also often recognizable by a following statement from the perpetrators. Violence—According to Walter Laqueur of the Center for Strategic and International Studies, "the only general characteristic [of terrorism] generally agreed upon is that terrorism involves violence and the threat of violence." However, the criterion of violence alone does not produce a useful definition, as it includes many acts not usually considered terrorism: War, riot, organized crime, or even a simple assault. Property destruction that does not endanger life is not usually considered a violent crime, but some have described property destruction by the Earth Liberation Front and Animal Liberation Front as terrorism. Psychological impact and fear—The attack was carried out in such a way as to maximize the severity and length of the psychological impact. Each act of terrorism is a “performance,” a product of internal logic, devised to have an impact on many large audiences. Terrorists also attack national symbols to show their power and to shake the foundation of the country or society they are opposed to. This may negatively affect a government's legitimacy, while increasing the legitimacy of the given terrorist organization and/or ideology behind a terrorist act. The September 11th attacks on the World Trade Center and Pentagon are examples of this. Attacking the World Trade Center symbolized the terrorist threat to the economic foundation of America and its capitalist ideals, and attacking the Pentagon symbolized that America's great military strength is yet vulnerable at its very core to the terrorist’s power. Perpetrated for a Political Goal—Something all terrorist attacks have in common is their perpetration for a political purpose. Terrorism is a political tactic, not unlike letter writing or protesting, that is used by activists when they believe no other means will effect the kind of change they desire. The change is desired so badly that failure is seen as a worse outcome than the deaths of civilians. This is often where the interrelationship between terrorism and religion occurs. When a political struggle is integrated into the framework of a religious or "cosmic" struggle, such as over the control of an ancestral homeland or holy site such as Israel and Jerusalem, failing in the political goal (nationalism) becomes equated with spiritual failure, which, for the highly committed, is worse than their own death or the deaths of innocent civilians. Deliberate targeting of non-combatants—It is commonly held that the distinctive nature of terrorism lies in its intentional and specific selection of civilians as direct targets. Much of the time, the victims of terrorism are targeted not because they are threats, but because they are specific "symbols, tools, animals or corrupt beings" that tie into a specific view of the world. Their suffering accomplishes the terrorists' goals of instilling fear, getting a message out to an audience, or otherwise accomplishing their political end. Unlawfulness or illegitimacy—Some definitions of terrorism give weight to a distinction between the actions of a legitimate government and those of non-state actors, including individuals and small groups. In this view, government actions that might be violent, operate through fear, aim at political ends, and target civilians would not be terrorism if they are being pursued by agents who are accountable to legitimate governmental authority. Governmental accountability, presumably, would operate to limit and restrain the violence, both in volume and tactics. However, governments which repeatedly resort to these kinds of tactics tend to lose legitimacy, eroding the distinction between governmental and non-governmental violence. The modern English term "terrorism" dates back to 1795 when it was used to describe the actions of the Jacobin Club in their rule of post-Revolutionary France, the so-called "Reign of Terror." Although there are earlier related examples, terrorism in the modern sense seems to have emerged around the mid-nineteenth century. An early example of the use of the term "terrorism" in the current sense is in Joseph Conrad's 1907 story, The Secret Agent, where it is used to describe anarchists attempting to cause terror and foment social disruption by blowing up Greenwich Observatory: "The venomous spluttering of the old terrorist without teeth was heard." What is one to say to an act of destructive ferocity so absurd as to be incomprehensible, inexplicable, and almost unthinkable; in fact, mad? Madness alone is truly terrifying, inasmuch as you cannot placate it either by threats, persuasion, or bribes. In 1867, the Irish Republican Brotherhood, a revolutionary nationalist group with support from Irish-Americans, carried out attacks in England. These were the first acts of "republican terrorism," which became a recurrent feature of British history, and these Fenians were the precursor of the Irish Republican Army. In Russia, by the mid-nineteenth century, the intelligentsia grew impatient with the slow pace of Tsarist reforms, and sought instead to transform peasant discontent into open revolution. Anarchists like Mikhail Bakunin maintained that progress was impossible without destruction. Their objective was nothing less than complete destruction of the state. Anything that contributed to this goal was regarded as moral. With the development of sufficiently powerful, stable, and affordable explosives, the gap closed between the firepower of the state and the means available to dissidents. Organized into secret societies like the People's Will, Russian terrorists launched a campaign of terror against the state that climaxed in 1881, when Tsar Alexander II of Russia was assassinated. At about the same time, Anarchists in Europe and the United States also resorted to the use of dynamite, as did Catalan nationalists such as La Reixa and Bandera Negra. Two groups within the Ottoman Empire also resorted to techniques considered by some historians to be in the same category as those used by the Anarchists. One group was those fighting for an independent Armenia, divided into two parties, the Social Democrat Hunchakian Party and the Dashnaks or Armenian Revolutionary Federation. The other group was those fighting for an independent Macedonia, divided into two organizations, the Internal Macedonian Revolutionary Organization (IMRO) and the External Macedonian Revolutionary Organization (EMRO). The IMRO was founded in 1893 in Thessaloniki, now in Greece but then part of the Ottoman Empire. This organization was driven by Slavic nationalism, and later acquired a reputation for ferocious attacks, including the 1934 assassination of Alexander I of Yugoslavia during a state visit to France. The Fenians/IRA, the Hunchaks and Dashnaks, and the IMRO may be considered typical of nationalist terrorism, and equally illustrate the (itself controversial) expression that "one man's terrorist is another man's freedom fighter." At least one of these groups achieved its goals: An independent Ireland came into being. So did an independent Macedonia, but the original IMRO probably contributed little to this outcome. The territories of Armenia, however, remain within the former Russian empire. Some of the most successful terrorist groups were the vast array of guerrilla, partisan, and resistance movements that were organized and supplied by the Allies during World War II. The British Special Operations Executive (SOE) conducted operations in every theater of the war and provided an invaluable contribution to allied victory. The SOE effectively invented modern terrorism, pioneering most of the tactics, techniques, and technologies that are the mainstays of modern terrorism. It could be said that throughout the Cold War, both sides made extensive use of terrorist organizations to carry on a war by proxy. Many of the Islamic terrorists of today were trained by the U.S. and UK to fight the USSR in Afghanistan. Similar groups, including the Viet Cong, received training from Soviet and Chinese military "advisers." The most sustained terrorist campaign of the twentieth century was that of the Irish Republican Army. The first campaign saw 26 of the 32 counties gain independence. A second campaign became know as "the Troubles" between 1972 and 1997, with the Provisional Irish Republican Army conducting bombings, assassinations, and even mortar attacks on the Prime Minister's residence, 10 Downing Street. Today, modern weapons technology has made it possible for individuals to cause a large amount of destruction alone or with only a few conspirators. Terrorism is a form of asymmetric warfare, and is more common when direct conventional warfare either cannot be (due to differentials in available forces) or is not being used to resolve the underlying conflict. In some cases, the rationale for a terrorist attack may be uncertain (as in the many attacks for which no group or individual claims responsibility) or unrelated to any large-scale social conflict (such as the Sarin gas attack on the Tokyo subway by Aum Shinrikyo). Acts of terrorism can be carried out by individuals, groups, or states. A state can sponsor terrorism by funding a terrorist organization, harboring terrorism, and also using state resources, such as the military, to directly perform acts of terrorism. When states provide funding for groups considered by some to be terrorist, they rarely acknowledge them as such. Opinions as to whether acts of violence by states consist of state-sponsored terrorism or not vary widely. For some, the distinction between "war" and "terrorism" is only semantic: "Terrorism is the war of the poor; war is the terrorism of the rich." The most common image of terrorism is that it is carried out by small and secretive cells, highly motivated to serve a particular cause. However, many of the most deadly operations in the twenty-first century, such as 9/11, the London underground bombing, and the 2002 Bali bombing were planned and carried out by a close clique, comprised of close friends, family members, and other strong social networks. These groups benefited from the free flow of information, and were able overcome the obstacles they encountered where others failed due to lack of information and communication. Terrorist attacks are often targeted to maximize fear and publicity. They usually employ explosives or poison, but there is also concern about terrorist attacks using weapons of mass destruction. Terrorist organizations usually methodically plan attacks in advance, and may train participants, plant "undercover" agents, and raise money from supporters or through organized crime. Communication may occur through modern telecommunications, or through old-fashioned methods such as couriers. Terrorists seek to demoralize and paralyze their enemy with fear, and also to pressure governments into conceding to the terrorist's agenda. While they act according to different motivations and goals, all terrorist groups have one tactic in common: to achieve maximum publicity in order to intimidate and generate a message as a means to attain its objectives. Terrorism uses violence on one part of society to instill fear in the larger part of society to make a change. Terrorism employs propaganda as a tactic to ensure the attention of the public through the attention from the media. The term "Propaganda of the Deed," coined by Malatesta, Cafiero, and Covelli, states that the message is most strongly conveyed through violence. Often, damage is done with an improvised explosive device although chemical weapons have been used on occasion. A source of concern is also a possible use of a nuclear weapon or biological weapons. Terrorist groups may also use chemical weapons as in the Sarin gas attack on the Tokyo subway in 1995. In the September 11, 2001 attacks, planes were used as guided incendiary devices. 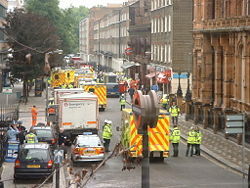 Terrorist groups may arrange for secondary devices to detonate at a slightly later time in order to kill emergency-response personnel attempting to attend to the dead and wounded. Repeated or suspected use of secondary devices can also delay emergency response out of concern that such devices may exist. 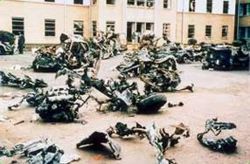 Examples include a (failed) device that was meant to release cyanide-gas during the February 26, 1993 World Trade Center bombing; and a second car bomb that detonated 20 minutes after the December 1, 2001 Ben Yehuda Street Bombing by Hamas in Jerusalem. Training camps have often been used to prepare terrorists to mount their attacks. For the September 11, 2001 attacks, the pilots also took flying courses. The range of training depends greatly on the level of support the terrorist organization receives from various organizations and states. In nearly every case the training incorporates the philosophy and agenda of the groups leadership as justification for the training as well as the potential acts of terrorism which may be committed. State sanctioned training is by far the most extensive and thorough, often employing professional soldiers and covert operatives of the supporting state. The training generally includes physical fitness, combat or martial arts, firearms, explosives, intelligence/counterintelligence, and field craft. More specialized training may include mission specific subjects such as, language, cultural familiarization, communications, and surveillance techniques. In every instance the quality of training is extremely high and well organized. Where terrorism occurs in the context of open warfare or insurgency, its perpetrators may shelter behind a section of the local population. Examples include the Intifada on Israeli-occupied territory, and insurgency in Iraq. This population, which may be ethnically distinct from the counter-terrorist forces, is either sympathetic to their cause, indifferent, or acts under duress. 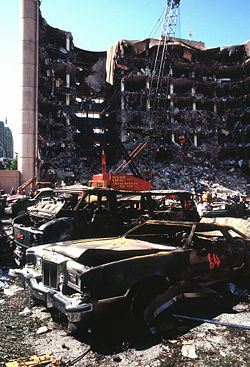 Terrorists preparing for the September 11, 2001 attacks changed their appearance to avoid looking radical. Funding can be raised in both legal and illegal ways. Some of the most common ways to raise funds are through charities, well funded organizations, or a non-violent organization with similar ideologies. In the absence of state funding, terrorists may rely on organized crime to fund their activities. This has included kidnapping, drug trafficking, or robbery. Some terrorist cells have relied on identity theft and fraud to raise funds. The revolution in communications technology has dramatically changed how terrorist organizations communicate. E-mails, fax transmissions, websites, cell phones, and satellite telephones have made it possible for organizations to contemplate a global strategy. However, too great a reliance on such technology leaves organizations vulnerable to sophisticated monitoring of communication. When the media published the information that the U.S. government was tracking Osama bin Laden by monitoring his phone calls, he ceased using this method to communicate. Responses to terrorism are broad in scope. They can include re-alignment of the political spectrum and reassessments of fundamental values. Responses that are directed specifically at preventing terrorist attacks are termed "counter-terrorism." Examples of several counter-terrorism strategies follow. Whatever the target of terrorists, there are multiple ways of hardening the targets to prevent the terrorists from hitting their mark. One method is to place Jersey barrier or other sturdy obstacles outside tall or politically sensitive buildings to prevent car and truck bombing. Aircraft cockpits are kept locked during flights, and have reinforced doors, which only the pilots in the cabin are capable of opening. English train stations removed their waste bins in response to the Provisional IRA threat, as convenient locations for depositing bombs. Scottish stations removed theirs after the July 7 bombing of London as a precautionary measure. The Massachusetts Bay Transportation Authority purchased bomb-resistant barriers after the September 11 terrorist attacks. Some countries see preemptive attacks as a legitimate strategy. This includes capturing, killing, or disabling suspected terrorists before they can mount an attack. Israel, the United States, and Russia have taken this approach, while Western European states generally have not. Another major method of preemptive neutralization is interrogation of known or suspected terrorists to obtain information about specific plots, targets, and the identity of other terrorists. Most counter-terrorism strategies involve an increase in standard police and domestic intelligence. The central activities are traditional: Interception of communications and the tracing of persons. New technology has, however, expanded the range of such operations. Domestic intelligence is often directed at specific groups, defined on the basis of origin or religion, which is a source of political controversy. Mass surveillance of an entire population raises objections on civil liberties grounds. Terrorism has been used to justify military intervention in countries where terrorists are said to be based. That was the main stated justification for the U.S. invasion of Afghanistan. It was also a stated justification for the second Russian invasion of Chechnya. Such a strategy against terrorism may not be successful since it does not address the causes of terrorism: Relative deprivation that leads to frustration, aggressive foreign policy that leads to hate, and psychosocial effects of globalization, for example. Thus repression by the military in itself—particularly if it is not accompanied by other measures—may result in short term victories, but be unsuccessful in the long run. The human security paradigm outlines a non-military approach which aims to address the enduring underlying inequalities which fuel terrorist activity. Causal factors are delineated and measures implemented which allow equal access to resources and sustainability for all peoples. Such activities empower citizens providing "freedom from fear" and "freedom from want." This can take many forms including the provision of clean drinking water, education, and vaccination programs, provision of food and shelter and protection from violence, military or otherwise. Successful human security campaigns have been characterized by the participation of a diverse group of actors including governments, NGOs, and citizens. One of the primary difficulties of implementing effective counter-terrorist measures is the waning of civil liberties and individual privacy that such measures often entail, both for citizens of, and for those detained by states attempting to combat terror. At times, measures designed to tighten security have been seen as abuses of power or even violations of human rights. Examples of these problems can include prolonged, incommunicado detention without judicial review; risk of subjecting to torture during the transfer, return and extradition of people between or within countries; and the adoption of security measures that restrain the rights or freedoms of citizens and breach principles of non-discrimination. Democratic principles and values are essential tools in the fight against terrorism. Any successful strategy for dealing with terrorism requires terrorists to be isolated. Consequently, the preference must be to treat terrorism as criminal acts to be handled through existing systems of law enforcement and with full respect for human rights and the rule of law. We recommend: (1) Taking effective measures to make impunity impossible either for acts of terrorism or for the abuse of human rights in counter-terrorism measures. (2) The incorporation of human rights laws in all anti-terrorism programmers and policies of national governments as well as international bodies. While international efforts to combat terrorism have focused on the need to enhance cooperation between states, proponents of human rights (as well as human security) have suggested that more effort needs to be given to the effective inclusion of human rights protection as a crucial element in that cooperation. They argue that international human rights obligations do not stop at borders and a failure to respect human rights in one state may undermine its effectiveness in the international effort to cooperate to combat terrorism. 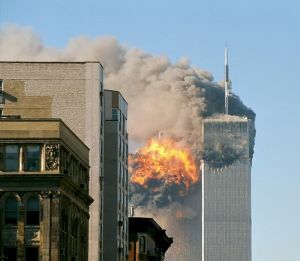 The September 11, 2001 attacks in New York City, and Washington D.C. The Mumbai train bombings on July 11, 2006. The 2011 Norway attacks on July 22, 2011. The Paris attacks on November 13, 2015. Some terrorist attacks or plots were designed to kill thousands of people, but either failed or fell short. Such plans include the 1993 World Trade Center bombing, Operation Bojinka, the 2006 transatlantic aircraft plot, and the June 30, 2007 Glasgow Airport Attack foiled by police and civilians. ↑ 1.0 1.1 1.2 1.3 Mark Juergensmeyer, Terror in the Mind of God: The Global Rise of Religious Violence (University of California Press, 2003, ISBN 0520240111). ↑ UN, With call for action, not more words, Annan outlines plan for radical UN reform. Retrieved November 25, 2015. ↑ Jeffrey Record, Bounding the Global War on Terrorism. Retrieved November 25, 2015. ↑ Walter Laqueur, No End to War—Terrorism in the 21st Century (New York, 2003, ISBN 0826414354). ↑ Reuters, Russia says Hezbollah not a terrorist group: Ifax Retrieved November 25, 2015. ↑ Ali Khan, A Legal Theory of International Terrorism, Published in 19 Connecticut Law Review 945-972 (1987). Retrieved July 25, 2007. ↑ Encyclopædia Britannica, Terrorism. Retrieved November 25, 2015. ↑ Britannica Concise, Malayan People's Anti-Japanese Army. Retrieved November 18, 2008. ↑ Michel Chossudovsky, 9/11 ANALYSIS: From Ronald Reagan and the Soviet-Afghan War to George W Bush and September 11, 2001 Global Research, September 9, 2010. Retrieved November 25, 2015. ↑ White House, President Meets with Afghan Interim Authority Chairman. Retrieved November 25, 2015. ↑ BBC, BBC News: PROFILES: Menachem Begin. Retrieved July 25, 2007. ↑ Palestine Facts, Why did Yasser Arafat get the Nobel Peace Prize? Retrieved August 1, 2007. ↑ BBC News, World: Africa: Profile: Nelson Mandela. Retrieved July 25, 2007. ↑ Sudha Ramachandran, Death behind the wheel in Iraq, Asian Times, November 12 2004. ↑ Alex Perry, How Much to Tip the Terrorist? Time Magazine, September 26, 2005. Retrieved July 25, 2007. ↑ Adrian Humphreys, "One official's 'refugee' is another's 'terrorist,'" National Post, January 17, 2006. Retrieved July 25, 2007. ↑ Ron Mock, Loving Without Giving In: Christian Responses to Terrorism and Tyranny (Cascadia Press, 2004), 24-28. ↑ Joseph Conrad, The Secret Agent, Ch. 3, 1907. Retrieved July 25, 2007. ↑ Joseph Conrad, The Secret Agent, Ch. 2, 1907. Retrieved July 25, 2007. ↑ Daniel C. Maguire, War. Retrieved August 1, 2007. ↑ Mark Sageman, Social Networks and the Jihad (Philadelphia: University of Pennsylvania Press, 2004), 166-167. ↑ Arthur Garrison, "Defining Terrorism," Criminal Justice Studies 17 (2004): 259-279. ↑ ABC News Online, Court upholds death sentences for sarin gas attackers. Retrieved November 25, 2015. ↑ Marc Sageman, Social Networks and the Jihad (Philadelphia: University of Pennsylvania Press, 2004), 158-161. ↑ 25.0 25.1 25.2 Human Rights News, Human Rights and Counter-Terrorism. January 29, 2004. Retrieved November 25, 2015. ↑ Secretariat Counter-Terrorism Task Force, The Madrid Agenda – Club of Madrid, 11 March 2005 Retrieved November 25, 2015. ↑ During the 9-11 attacks a fourth plane, United Airlines Flight 93, a Boeing 757-222, crashed in a field in southwest Pennsylvania just outside of Shanksville (Somerset County), Pennsylvania, about 150 miles (240 km) northwest of Washington, D.C., at 10:03:11 a.m. local time (14:03:11 UTC), with parts and debris found up to eight miles away. The crash in Pennsylvania is believed to have resulted from the hijackers either deliberately crashing the aircraft or losing control of it as they fought with the passengers. It is also believed that the hijackers intended to crash the plane into the White House, or the Capitol building in Washington, D.C.
↑ The Pentagon Building is actually across the Potomac River in Arlington County, Virginia, but is generally considered to be a part of the greater Washington D.C. area. Arreguín-Toft, Ivan. "Tunnel at the End of the Light: A Critique of U.S. Counter-terrorist Grand Strategy." Cambridge Review of International Affairs 15 (3) (2002): 549-563. Cronin, Audrey Kurth. "Behind the Curve: Globalization and International Terrorism." International Security 27 (3) (Winter 2002/03): 30-58. Juergensmeyer, Mark. Terror in the Mind of God: The Global Rise of Religious Violence. University of California Press, 2003. ISBN 0520240111. Kalyvas, Stathis. The Paradox of Terrorism in Civil Wars (2004). Journal of Ethics 8 (1): 97-138. Retrieved July 26, 2007. Köchler, Hans (ed.). Terrorism and National Liberation. Proceedings of the International Conference on the Question of Terrorism. New York: Peter Lang, 1988. ISBN 3820412174. Laqueur, Walter. No End to War: Terrorism in the 21st Century. New York: 2003. ISBN 0826414354. Merari, Ariel. "Terrorism as a Strategy in Insurgency." Terrorism and Political Violence 5 (4) (Winter 1993): 213-251. Mock, Ron. Loving Without Giving In: Christian Responses to Terrorism and Tyranny. Cascadia Publishing House, 2004. ISBN 978-1931038249. Sageman, Marc. Social Networks and the Jihad. Philadelphia: University of Pennsylvania Press, 2008. ISBN 978-0812240658. Sunga, Lyal. U.S. Anti-Terrorism Policy and Asia’s Options. In Johannen, Smith and Gomez (eds. 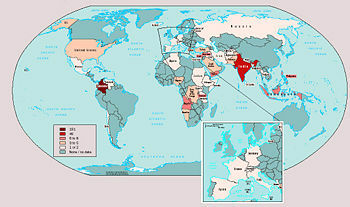 ), September 11 & Political Freedoms: Asian Perspectives (Select) (2002): 242-264. This page was last modified on 25 November 2015, at 20:51.